PLACE THE HADDOCK IN A LARGE SAUCEPAN OF WATER AND BRING TO THE BOIL. TURN OFF THE HEAT AND ALLOW FISH TO SIT IN THE WATER, COVERED, FOR 12-15MINS. DRAIN AND SET ASIDE. BRING THE STOCK TO THE BOIL IN A LARGE PAN OVER A MEDIUM HEAT, THEN TUR...N THE HEAT DOWN AS LOW AS IT WILL GO TO KEEP THE STOCK HOT BUT WITH OUT LETTING IT REDUCE. PLACE 198ML/7FLOZ OF THE WARMED STOCK IN ANOTHER LARGE PAN ADD THE ONION AND LEEK (FORGOT TO MENTION ABOVE- 1 LARGE LEEK, WASHED AND FINELY CHOPPED) AND COOK FOR 3-4 MINS UNTIL THEY HAVE SOFTENED. ADD THE RICE AND COOK FOR 2-3MINS. STIR IN THE PEAS AND SPINACH. ADD THE HOT STOCK TO THE RICE A LADLEFUL AT A TIME AND KEEP STIRRING UNTIL EACH LADLE IS ABSORBED. KEEP ADDING THE STOCK, STIRRING AS OFTEN AS POSSIBLE UNTIL THE RICE IS AL DENTE (APPROX 20-25MINS). SKIN AND FLAKE THE HADDOCK INTO LARGE BITE SIZED PIECES AND GENTLY STIR IT INTO THE RICE. 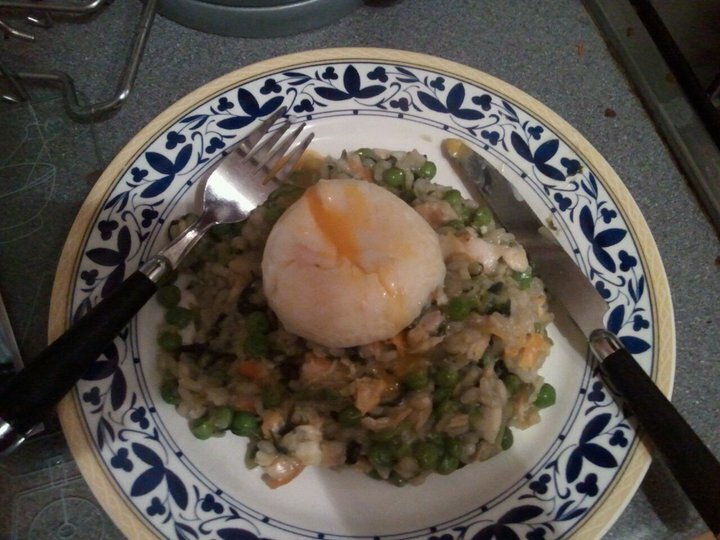 KEEP THE RISOTTO WARM WHILE YOU POACH THE EGGS. 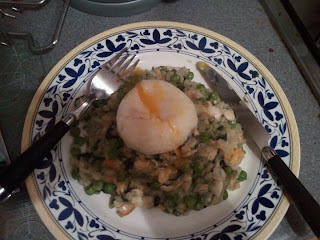 DIVIDE THE RISOTTO BETWEEN 4 PLATES, TOP EACH WITH A POACHED EGG AND SERVE IMMEDIATELY.